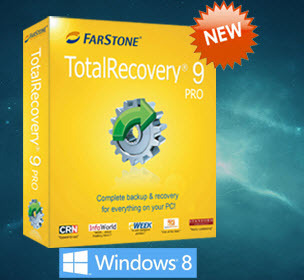 TotalRecovery Pro 9.0 serves as a complete data backup (Incremental too) and disk imaging solutions with network capability as you can share the backup copy or created image to networked computers or host it to FTP server. This tool provides powerful yet affordable solution to help you in taking backup of priceless data or create a complete image of hard disk or any specific partition and later, performs recovery if anything goes wrong or disaster strikes. Created backup or image copy can be transferred to an external hard drive or USB too, to perform recovery. TotalRecovery Pro offers unique functionality of creating hard disk image of only used blocks to keep the image size at its lowest. Moreover, File compression functionality is also provided to help reduce the size of created image even further. Using this tool, you can take incremental copy of backup to save any newly modified or stored files. Whenever data corruption occurs or system failure happens, the network administrator would then be able to restore data. The software provides special capability called Recovery Manager to boot into inaccessible Windows and performs data backup or restore damaged partitions. Using simple explorer like interface, you can performs almost every task with easy and clone any desired partitions. The software supports all the latest version file system including FAT, FAT32, NTFS, NTFS5 etc. and various hard drive attachment technologies such as IDE, EIDE, SATA, SCSI/RAID, GPT and more. You can use this tool when the current drive is full or simply, you’re planning to move out to new HDD or SSD. Just clone the entire hard drive and restore it on the new hard drive. Complete OS and all your documents will be replaced to new drive intact. Backup copy customization, incremental backup or image copy, backup copy compression etc. Total Recovery Pro offers unique platform for users don’t want to experience data loss circumstances either at their home or their office location. Different backup and disk imaging solutions comes with unique capability and helps users to restore data or rebuild and recover data from failed or unbootable system. You can backup almost any type of storage drive around your location like USB, complete hard drive, virtual machine, server etc. There is an option to backup entire drive or any selected folder using a single click using One-Click Backup wizard. There is an option to keep your spy eye on the task lists recently performed so could you easily ensure yourself that you’ve backup of recently stored or important files. Using Recovery Manager, you can restore or recover data on boot times, just before the operating system kernel initializes. Comes with almost all the backup capability till date and not so any eye catching drawbacks that worth mentioning. The Verdict: Top Performer under backup and Imaging software categories. I've found this software pretty useful and fast in taking backup or imaging or cloning the drive. At the very affordable cost, you've so much to get benefited using this software. Highly recommended.